High precision pressure reducing valve with motorized actuator for remote operation (with built-in separator and trap). 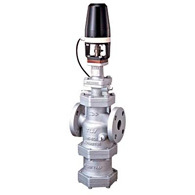 A motorized actuator is mounted on the pressure reducing valve, and the set pressure can be adjusted using the included controller. This allows the pressure to be adjusted even when the reducing valve and the controller are separated from each other by a distance. The MC-2 controller features a digital display of the secondary pressure, which allows adjustments to be made while confirming the pressure right at hand. Supplies steam at a stable pressure. Even if the steam flow (load) to the equipment or the primary pressure at the pressure reducing valve changes, the Shock-absorbing Spherical piston (SAS) supplies steam at a constant pressure in order to maintain the temperature of the steam used as the heating source. Condensate entrained inside the steam piping is removed, enabling the supply of very dry steam. Product features a built-in Cyclone Separator with a 98% condensate separation efficiency. The separator improves the dryness of the steam and removes scale entrained in the steam. The condensate that is separated out is quickly removed through the built-in Free Float® steam trap. This improvement in the quality of the steam itself also results in an improvement in the heat conductivity of the steam. For use in situations in which a pressure reducing valve must be installed in a location that is distant or that is difficult for the operator to reach (e.g. locations that are high off the ground or are too small for an operator to fit into easily), for which remote operation of pressure setting adjustment is desirable.